Note: The Web Audio API is available on Safari 6 and later, and Safari on iOS 6 and later. Play a sound at a precise moment in time. Synthesize aural tones and oscillations. Mix sound effects with filters. Access the raw bits of audio data. Some use cases of the Web Audio API include supplementing HTML5 games with sound effects, controlling DJ-style music players, and visualizing music in new, innovative ways. Harness the power of the Web Audio API to create new web experiences that are augmented with sound. In this chapter you’ll learn how to start using the Web Audio API in your web apps. Note: Details of specific class references can be found at the W3C Web Audio API specification. Before you can play any sounds, you must first create an audio context from which the sound can play. Similar to how HTML5 canvas requires a context on which lines and curves are drawn, Web Audio requires an audio context on which sounds are played and manipulated. This context will be the parent object of further audio objects to come. Your audio context is typically created when your page initializes and should be long-lived. You can play multiple sounds coming from multiple sources within the same context, so it is unnecessary to create more than one audio context per page. Note: In Safari, the audio context has a prefix of webkit for backward-compatibility reasons. Since the Web Audio API is a work in progress, specification details may change. Once an audio context has been instantiated, fetch your sounds from the disk or from a server. Load all the sounds upfront that you anticipate could play to avoid a delay caused by network transmission. Then, buffer the sounds so that they’re ready to be played at a moment’s notice. The buffer is essentially a nonpersistent cache that allows you to replay sounds repeatedly without needing to reload the resource. You load sounds with an asynchronous XMLHttpRequest. Set the response type of the request to arraybuffer, which interprets the audio file as binary data. Add an event listener on the request to capture the sound buffer as soon as it loads. When the resource loads, pass the response of the AJAX request to the createBuffer() function on your audio context. Below is the bufferSound() callback function that is referred to above in the event listener. Instead of calling createBuffer() directly, you can create a buffer by using the decodeAudioData() function on your audio context. The decodeAudioData() function provides an optional third parameter you can use to catch errors. If you want to pull the audio of an <audio> or <video> element that’s already on the page, you can bypass both the XMLHttpRequest creation and manual buffering steps by calling your audio context’s createMediaElementSource() function. Pass a reference to your desired media element to return a buffered source. This can be used, for example, to change the pitch of the video’s sound dynamically while the video plays. 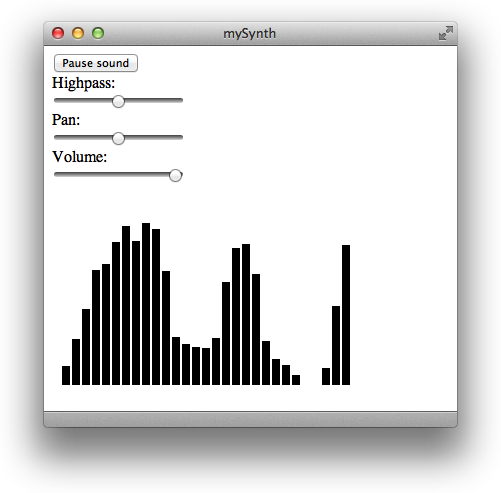 Instead of loading a preexisting audio file, you can generate sounds with the Oscillator object. Oscillators are great for creating beeps and single notes. Create an oscillator with the createOscillator() constructor, and assign a waveform to its type property. Acceptable values for the type property are listed in Table 3-1. Oscillators produce tonal sounds. You can adjust the sound of the emitted tones in the same fashion as adjusting any source, as further described in, Routing and Mixing Sounds. Now that you have your source buffered or synthesized, for sound to emit from your speakers you need to connect your source to a destination. You can route your source through a complex graph of nodes (which is covered in the next section, Routing and Mixing Sounds), but for now, connect it directly to the destination of your audio context. You can do this by passing the destination property of your audio context to the connect() function of your source. Connecting a source to a destination is like hooking up an electric guitar to an amplifier: the input needs to connect to the output in order to create an audible sound. The destination property always correlates to the default hardware output of sound, whether it’s through speakers, attached headphones, or a Bluetooth headset. To play the sound immediately, call the noteOn(0) function on your source object. Note: On iOS, the Web Audio API requires sounds to be triggered from an explicit user action, such as a tap. Calling noteOn() from an onload event will not play sound. To stop playing the sound immediately, call noteOff(0) on your source. Instead of 0, you can also pass the currentTime property of your audio context. By specifying a time, you can schedule a precise beat or rhythm for your sounds to start playing. If the beat is steady and consistent, you can choose to call noteOn(0) in a setInterval() with the interval of your choice. Otherwise, you can calculate when the sounds will play in the future, and call noteOn() in a loop with the relative playtimes as the argument. Note: A given source may not issue a noteOn() after a noteOff(). The beauty behind the Web Audio API is that you can insert a graph of audio nodes between your source and destination to alter the voice of the sound. This concept mimics a guitarist’s pedal board. Electric guitarists pass their raw audio input through pedals, or audio filter effects, before the sound plays as audible output. This gives them finer control to transmogrify their audio output. Just like how a musician can string together a chain of pedals, you can create an intricate network of multiple audio sources and filters to modify your produced sound. The example below routes the input source through a compressor, then a reverberation modifier, and then a volume control, before the sound is played. Imagine a guitar that’s hooked up to a chain of pedals, which then feeds into an amp. The connect() function is metaphorically a cable connecting audio equipment together. There are many filter effects from which to choose; one of the most commonly used and most helpful to include in your virtual pedal board is a compressor. Compressors boost soft tones and diminish loud tones, normalizing the audio output so that there are no parts that are extremely quiet or extremely loud. This creates a more pleasant listening experience and prevents strain on the listener’s ears. While this effect is beneficial in the majority of cases, there are some instances when a compressor would not be desired—for example, someone listening to classical music would want to hear every subtle pianissimo and grand fortissimo. You can also mix several sources together to play out of the same destination. This is useful for crossfading between two tracks: with one set of controls, you can manage two separate sources simultaneously. Just instantiate a new source as described in Fetching and Buffering Sounds or Synthesizing Sounds, and connect it to the same destination. Note: Make sure that your last filter is connected to your destination before you call noteOn(). Access the raw data of the audio output by routing your sound through a real-time analyser node. Use your imagination and creativity to come up with interfaces for playing and visualizing sound. Listing 3-1 selects a sound at random, passes the sound through audio filters, and loops the sound while the audio spectrum is drawn on an HTML5 canvas, as shown in Figure 3-1. It also provides controls for adjusting filter properties and pausing a playing sound.